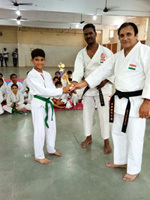 Vransh Sharma of Grade 7C, was adjudged Best Player (Senior Group) at the District Karate Technical Seminar and Camp 2017 organised by Bhopal District Karate Association. Congratulations Vransh! !